I’m one of those people with straight hair that can’t get curls or even waves by using a curling iron. It just doesn’t work. And even if it does make my hair slightly wavier (requiring massive amounts of hairspray), it doesn’t last for more than a couple hours before the waves go flat and straight again. For years, the only way my hair could get any kind of lasting waviness was if I went to bed with my hair wet in actual curlers, but who wants to wear curlers to bed all the time? Definitely not me. I started braiding my hair at first because I was tired of always waking up with it tangled. One of the downsides of having long hair is the time it takes to brush it out all of the tangles. It was the worst in the winter months because my hair would seem to get even more tangled with the coarser fabric of all of the heavy sweaters I was wearing. Since I was tired of the tangles, I decided to go the old-fashioned route and braid my hair before bed just like you read about in old books and see Ma Ingalls do on every episode of Little House on the Prairie. Braiding my hair kept it tangle-free, and, as an added bonus, it made my hair wavy too! The first thing you want to do is to start with clean hair because washing your hair will undo all of the waviness from the braid. This method works great for me because I usually wash my hair in the evenings rather than trying to wake up extra early to do it in the morning. If you usually wash your hair in the morning, though, you might still be able to get a few waves if you braid your hair and leave the braid in while you finish getting ready, but it probably won’t work as well as leaving the braid in overnight. The next thing you want to do is to brush your hair. Brushing your hair is a good natural way to improve the health and appearance of your hair for one thing, but also, if you brush any tangles our of your hair the night before, all you have to do the next morning is to unbraid your hair and then style it however you want. 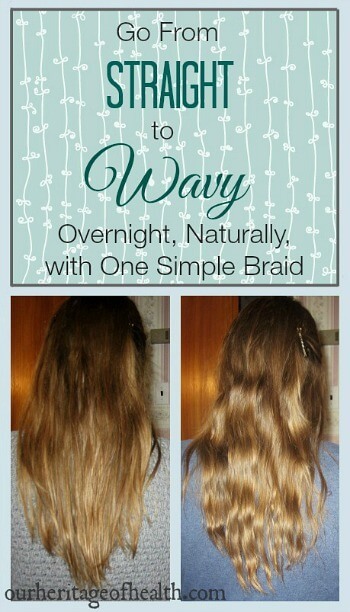 And if you brush it before braiding, you don’t have to worry about brushing any of the waviness out of your hair either. 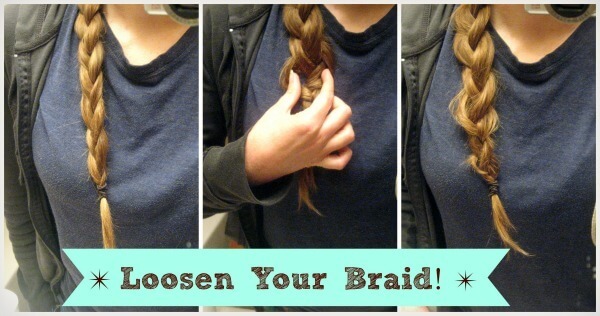 Step number three is to make your braid nice and loose. * The key to having subtle, more natural looking waves is to make sure the braid is loose, not tight. * If the braid is too tight, you’ll end up with crimped hair rather than wavy hair. So, unless you want to look like one of those Crimp N’ Curl Ponies from the 90’s, loosen your braid! After I’ve braided my hair, I just pull at the pieces with my fingers to make sure that they’re nice and loose. You also want to try end the braid as close to the end of your hair as possible, otherwise you’ll end up with wavy hair and then a few inches of straight hair at the bottom. Depending on your hair type, you could also mist your hair with a spray bottle to make the waves more pronounced. I usually just braid my hair dry unless it’s still a little bit damp after taking a shower, and it still works fine for me. The other option is to mist your hair with a bit of natural hairspray to help it keep its hold better. You don’t want to use too much or your hair will be stiff and crunchy in the morning, but a light mist will help the waves keep their shape. Since I don’t want to breathe in all of the chemicals in regular hairspray, I switched to a more natural kind. You can find the hairspray I usually use here . In the morning, just unbraid your hair, run your fingers through it a bit, and you’re good to go! 1) They’re Really Easy and Quick! Unlike using a curling iron, putting your hair into a braid literally takes less than a minute. And the best part for me is that it’s something I can do the night before rather than trying to rush around in the morning. I like my sleep, and I don’t usually get up any earlier than I have to, so I love being able to just unbraid my hair, run my fingers through it quickly, and continue on with my morning. A braid is really comfortable to sleep in, unlike curlers or bobby pins. And, as we know, good quality sleep is really, really important for good health, so that’s an added bonus! Before I started braiding my hair, I would wake up every morning with a huge tangled knot that would take me forever to try to brush out the next morning. Braiding my hair saves me so much time and trouble every morning. Since braids keep your hair from getting tangled, they also help to keep your hair healthier since you don’t have to yank a brush through it all the time, potentially breaking strands, while you try to get rid of all the tangles. I can’t guarantee this method will work equally well for everyone since everyone’s hair is unique, but it’s such an easy thing to do that’s it’s certainly worth a try. So, if you want easy, naturally wavy hair, tap into your inner 19th-century woman and start braiding your hair! Want to Learn More About Natural Beauty? 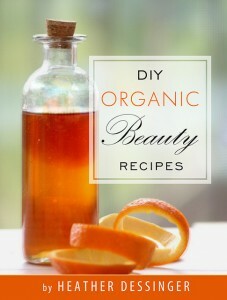 If you like trying out new DIY recipes or learning new natural beauty tips, one of my favorite DIY beauty books is DIY Organic Beauty Recipes by Heather Dessinger. I just found you through Cheeseslave! 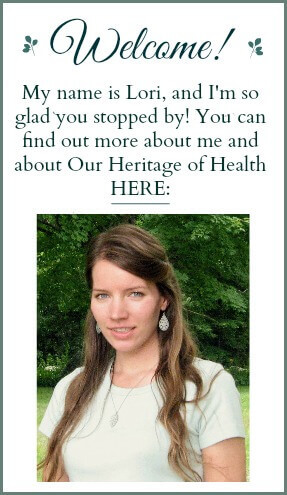 I’m north of Boston 🙂 I also have a blog, mostly about parenting and some recipes too. You’ve pretty much described my hair, it’s impossible to curl too 🙂 I do this a lot, except I never thought to put some natural hair spray on it to make it last longer! I braid my 5 year old daughter’s hair a lot too. This is a great idea! I have very short (just below chin) thick, wavy hair. I can never seem to enhance my natural waves enough to make my hair look presentable. This worked perfectly! (I did do multiple braids, so I wasn’t exactly able to answer the door like that 😛 ) Thanks for the post! That’s great, Rose – I hope it works well for you! And Happy Easter to you too! My hair is VERY thick, shoulder length, and naturally wavy. I normally let my hair air dry, thinking that in the morning it will look beautiful, but every time when I wake up it ends oh looking like a knotted rats nest. I have tried so many things and my hair has always been extremely poofy and frizzy. Until I followed your braiding tips and slept with my hair slightly damp, and my hair was FABULOUS! I don’t normally get comments about my hair, but I got bunches that day. Thanks for helping me tame my unruly hair!!!! You have no idea how much this helped me ,just like Krystal I have THICK hair and I’m only 14 🙁 but hey these waves came out soooooo cute ! thank you!! I tried this on my 14 year old daughters hair, she has very straight her and she wanted a change.It worked great, she is really pleased with the results.she is going to do this to have wavy curls for her school photos on Monday.Thank you.It is great she wont have to damage her hair with any heated curling products and by my experience the results from bought curling appliances don’t last long and take ages to use and they are expensive to buy, so this method is easy,with no expense and has fantastic results. Many thanks Lori. I’m so glad it worked well for her! Heat styling products have never really worked for me either. The curls last for an hour or two and then just fall flat. When I braid my hair, though, the waves last all day! I’m going to have to try this. My hair is thin, long and straight. Very ugly. Thank you for the tips! You’re welcome 🙂 I hope it works for you! I’m really glad it worked out well for you! 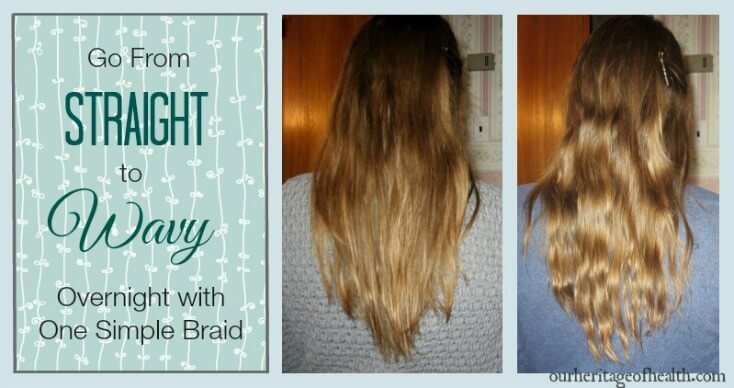 I usually braid mine when it’s dry or slightly damp but almost dry. I’ve found that, for me, if my hair is too wet then it ends up being too pronounced of a wave (and it looks crimped if I don’t make the braid loose enough), but dry works much better for me. It depends a little bit on hair type, too, though. 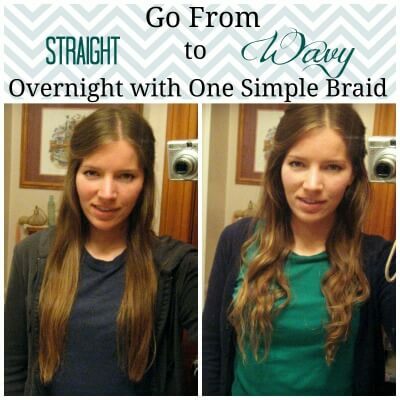 If your hair is really straight and doesn’t hold curls well at all, then you might find that it works better to have your hair be slightly damp, but if your hair has a little bit of natural wave already, then braiding it completely dry might work better. What kind of scarf to wrap it up with to ensure best results also I wetted my hair a little bit after braiding it I also use moose. I think you could probably use any kind of scarf as long as it’s one that feels comfortable to you.